Modern bathrooms are all about making a statement in the home, and small details can make all the difference! The sink is one of the most important features of any bathroom, so why not give it the credit it deserves, and add a little touch of creativity? Here are 16 of our favourite sink designs that push the boundaries of traditional bathroom design. This bathroom sink inspired by melting ice is a stunning statement piece. Made from glass and illuminated by concealed lights, this sink is a truly contemporary piece. Contrasting black walls and cabinetry give this sink an even more modern edge. Like what you see? Improve on this design by incorporating a sustainable water feature to really emphasise the iceberg-like structure. There’s more than meets the eye with this modern sink. Inspired by the form of the Calla Lily, this sink is made from Cristalplant, the ‘first eco-sustainable solid surface’. Made from polyesters of plant origin, Cristalplant products such as this sink can be recycled or reused once you no longer want them. It is also a low-VOC material, and therefore produces less CO2 throughout its lifetime. A visually captivating sink design, this piece by Julia Kononenko is actually a topographic map of the streets in the centre of London, England. Once water pours from the tap it will flow through the wooden maze-like paths to create river channels and water ducts throughout the city. The wooden design is an innovative homage that seamlessly integrates itself in the modern bathroom, whilst also making a stylish statement. 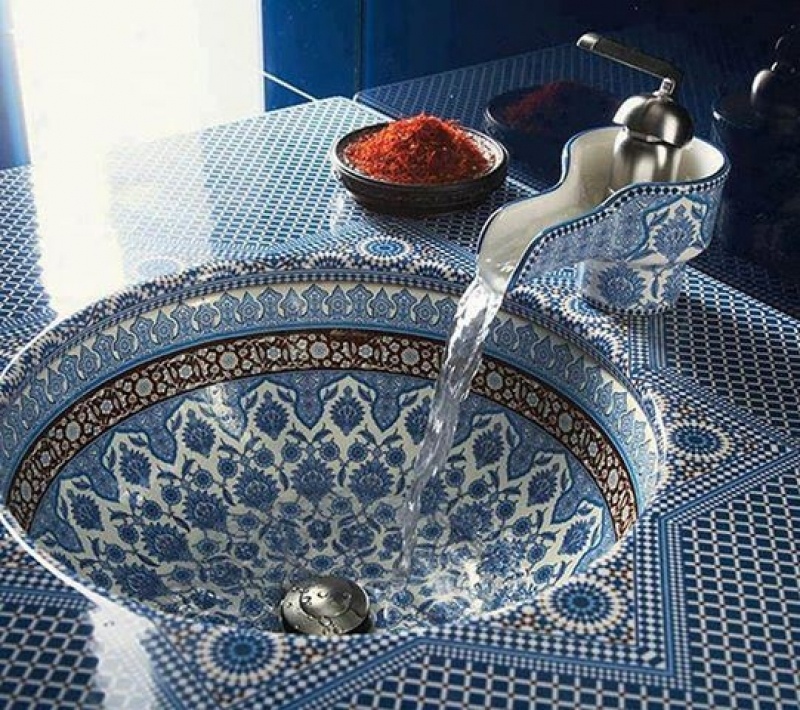 Upcycled sinks can come in a huge range of designs, materials, and sizes. An upcycled bathroom sink is not only about sustainability, it’s about seeing an object’s potential and transforming it into something completely different. The perfect way to give your bathroom a creative twist – use a rustic cabinet or table for a quick yet stylish sink design, or think out of the box like with this sink made from a bicycle. Channel an undersea wonderland vibe with this aquarium-inspired sink. Featuring a sleek clear glass design, this sink also includes a water pump, water filter and two circular openings on the surface for feeding and maintenance of your mini school of fish. A true statement piece, just remember to consult a pet store, aquarium or fish expert about how many fish per square inch is appropriate and safe. You could also consider repurposing this design into a terrarium. This design might not be for everyone, but it is a massive water saver and a space saver all in one. Every time you flush, fresh, clean water is directed up into the faucet so you can wash your hands. After washing your hands, the dirty water will drain into the toilet’s tank to be used for the next flush. Nature meets contemporary design in this piece, which is sure to give an otherworldly edge to your bathroom. This fossil-shaped sink highlights the organically beautiful form of concrete structures. A stylish nod to a now extinct cephalopod species, ammonites are known for their hypnotic spiral structures, making them perfect for creating a truly chilled out space. Elegant and unassuming, glass bottomed sinks are a subtle way to give your bathroom a luxe feel. The Motif Basin features a transparent design that, once illuminated by natural or artificial lights, projects a gorgeous pattern onto the counter. Made by OMVIVO, this glass bottomed sink is available in three designs including Pebble Glass, Kaleidoscope Glass, and Forest Glass, and can be installed with the complementing counter or integrated into a piece of your own choosing. Make a splash with the Eaux Eaux or Waves Waves sink, designed by Joel Roberts. Made from stainless steel, each sink features a curved form that suggests movement like a crashing wave. The contemporary sink also includes a seamless basin and faucet design that removes the clunkier aspects of a traditional sink. Fix the sink to a stone countertop or have it installed onto a countertop of your choice. No two natural stone pieces are alike, so the array of shapes, colours, details and flaws each piece showcases makes for a truly fascinating sink design. Source your own stone and have it repurposed by a specialist, or buy a ready-made natural stone sink. You can even try to incorporate a water saving tap or other features to emphasise the eco-consciousness of the design. Designed by Rapsel, this sink design is about creating a space that is seamlessly functional, even if you don’t realise it on first glance. Both the sink and the toilet in this design are concealed by minimalist larch wood lids that can be folded over the amenities to create additional shelving and seating as needed. Your bathroom has never been so practical! This Moroccan-inspired piece named ‘Marrakesh’ is inspired by Moorish architecture. Featuring a mosaic style design that is bold, bright and fun, this sink is a delightful combination of modern design and classic style. A strong statement that will instantly transform your bathroom into a dynamic cultured space, you can also purchase a matching mosaic faucet for extra impact. This basin is called ‘Skin’, and for a very good reason. Designed by Daniele Lago, this sink effortlessly peels off the wall. Sleekly minimal, this wall extension is perfect for creating an ultra-modern bathroom that is understated yet elegant. Available in both metal or mosaic styles, it can also be lit from below. The Orbit Sink by Alessandro Isola features a cylindrical design with hidden surprises. Three swiveling circles are incorporated in the piece, instantly creating additional shelving or storage. Simply pull out a circle when you need it, and then fold it back into the design when you don’t. It even comes with a towel rack!